THOR BACON earned a BA in Creative Writing at Antioch College. When not working as a goldsmith he keeps busy on his first full-length book. 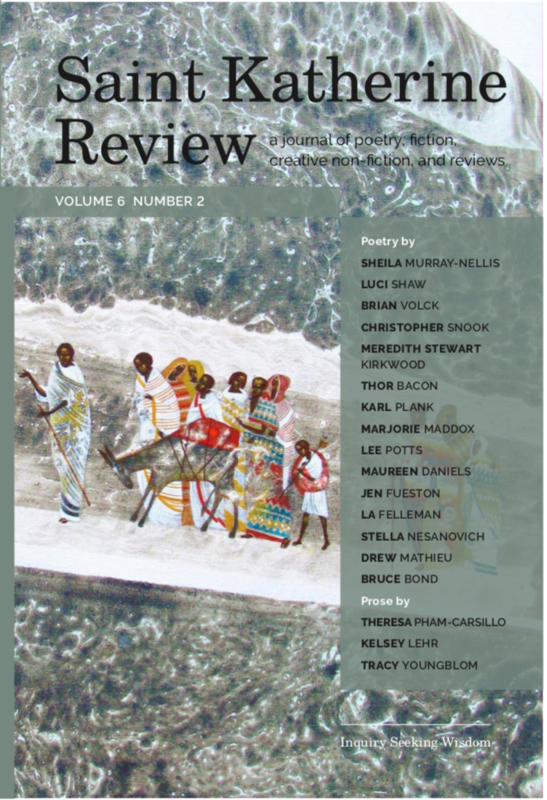 Recent poems appear in The Aurorean, Qua, Walloon Writers Review, and International Times. BRUCE BOND is the author of twenty books including, most recently, Immanent Distance: Poetry and the Metaphysics of the Near at Hand (U of MI, 2015), Black Anthem (Tampa Review Prize, U of Tampa, 2016), Gold Bee (Helen C. Smith Award, Crab Orchard Award, Southern Illinois University Press, 2016), Sacrum (Four Way Books, 2017), and Blackout Starlight: New and Selected Poems 1997-2015 (L. E. Phillabaum Award, LSU, 2017). Five books are forthcoming: Rise and Fall of the Lesser Sun Gods (Elixir Book Prize, Elixir Press), Frankenstein’s Children (Lost Horse Press), Dear Reader (Free Verse Editions), Scar (Etruscan Press), and Words Written Against the Walls of the City (LSU). Presently he is a Regents Professor of English at the University of North Texas. currently, LA FELLAMAN is an accountant at the University of Iowa. Before that, she was a seminary professor. Prior to that, she was a pastor. She moved to Iowa City with her husband in June 2016 and started writing poetry soon afterward. In order to learn this new craft, LA attends the Free Generative Writing Workshop and participates in local poetry readings. Her poems have appeared in the Moon Zine, Poetry in Public, Cedar Valley Divide, The Write Launch, and Tiferet. of Colorado, Boulder, as well as internationally in Hungary, Turkey, and Lithuania. MEREDITH STEWART KIRKWOOD’S poetry has appeared or is forthcoming in Eastern…market. Find her on the web at mkirkwoodblog.wordpress. com. KELSEY LAHR has worked summers as a park ranger in Yosemite National Park since 2008. She holds a Master’s degree in communication from the University of Utah and teaches communication studies at Westmont College in Santa Barbara, CA. Her literary nonfiction has appeared in Blue Lyra Review, The Copperfield Review, Dark Matter, Gold Man Review, and elsewhere. Her essay ‘Cranes’ was the first runner-up for the Green Briar Review’s 2016 Nonfiction Prize. Kelsey’s work has been nominated for a Pushcart Prize and publication in the Best American Science and Nature Writing series. DREW MATHIEU is graduating from the University of Missouri this May, with degrees in English and Journalism. He is a photo editor at the Missourian, a digital producing student at Newsy, and a frequent guest on the Recorder on the Wall Podcast. SHEILA MURRAY-NELLIS was born and raised in the Boston area, receiving a BA in philosophy from Clark University. She has spent her adult years in Quebec, Vermont, and British Columbia. For the past ten years, she has lived in a boat-access only community on Kootenay Lake in the Purcell Wilderness area of British Columbia where she and her husband, an Orthodox priest, are building a Byzantine-style stone chapel. Her work has been published in a few smaller journals and has received several awards. Among her publications is a book of poetry You Are Meant to Be Like Fire. She also writes children’s literature. TERESA PHAM-CARSILLO is a writer living and working in Oakland, California. Journal, Zone 3, Iron Horse Review, Briar Cliff Review, and Poetry Daily. A past winner of the Thomas Carter Prize (Shenandoah) and a Pushcart nominee, he is the J.W. Cannon Professor of Religious Studies at Davidson College. LEE POTTS recently returned to writing poetry after a 25-year break. His work has appeared in several journals including Painted Bride Quarterly, Gargoyle, Door is a Jar, Burningword, and Cold Creek Review. He is a Franciscan Tertiary (OFS) and lives just outside of Philadelphia with his wife and youngest daughter. You can find him online at leepotts.net. LUCI SHAW was born in London, England in 1928. A poet and essayist, since 1986 she has been Writer in Residence at Regent College, Vancouver. Author of over thirty-five books of poetry and creative non-fiction, her writing has appeared in numerous literary and religious journals. In 1913 she received the 10th annual Denise Levertov Award for Creative Writing from Seattle Pacific University. Her new collection, Eye of the Beholder, will be released by Paraclete Press in 2018. CHRISTOPHER SNOOK’S poetry will appear in 2018 editions of the Literary Review of Canada, The Windhover, The Remembered Arts Journal, and Presence. He writes in his hometown of Dartmouth, Nova Scotia. BRIAN VOLCK is a pediatrician who received his undergraduate degree in English Literature and his MD from Washington University in St. Louis and his MFA in creative writing from Seattle Pacific University. He is the author of a poetry collection, Flesh Becomes Word, and a memoir, Attending Others: A Doctor’s Education in Bodies and Words. TRACY YOUNGBLOM’S published work includes two chapbooks of poetry (Driving to Heaven and One Bird a Day) and one full-length collection (Growing Big). Recent individual poems, stories, and essays have appeared or are forthcoming in Big Muddy, Wallace Stevens Journal, QU Literary Journal, DMQ, Cumberland River Review, Westview, Foliate Oak, Frostwriting, Ruminate, neat magazine, and other places. Youngblom has earned two Pushcart nominations as well. She lives in the Minneapolis area and is at work on a hybrid collection of prose and poetry from which this piece comes.